Core 2 vs. Core is at the top of this week's 'Book Review. The consumer MacBook has been upgraded from Core Duo to Core 2 Duo, and the 2 GHz models now have twice as much RAM, bigger hard drives, and 6x dual-layer SuperDrives. That also means better prices on refurbished Core Duo MacBooks (see Bargain 'Books for details). Benchmarks at Bare Feats and Macworld find the Core 2 Duo averages 10% faster than the Core Duo - and is significantly faster on some tests. PR: CUPERTINO, California - November 8, 2006 - Apple on Wednesday unveiled its new line of MacBook consumer notebooks that now include Intel Core 2 Duo processors. Just one-inch thin, the new MacBooks are up to 25% faster than the previous generation and feature a built-in iSight video camera for on-the-go video conferencing, Apple's MagSafe Power Adapter that safely disconnects when under strain, and iLife '06, Apple's award-winning suite of digital lifestyle applications. "MacBook has helped drive Apple's notebook market share to over 10% in US retail, and the new MacBooks will be among this holiday season's most exciting new products," said Philip Schiller, Apple's senior vice president of Worldwide Product Marketing. "With Intel Core 2 Duo processors across the entire line, these new MacBooks are up to 25% faster than their predecessors." With prices starting at just $1,099, the new MacBook lineup includes three models: sleek white 1.83 GHz and 2.0 GHz MacBook models, and a stunning black 2.0 GHz MacBook model. With Intel's latest Core 2 Duo processors, the new MacBook is up to 25 percent faster than the previous MacBook and up to six times faster than the iBook, making it even easier for consumers to manage and enjoy their digital content with iLife '06. * Consumers will also benefit from the added power in the new 2.0 GHz models, including double the memory and greater storage capacity than the previous generation, as well as a double-layer SuperDrive for burning professional-quality DVDs. The new MacBook features a gorgeous 13" glossy widescreen display, ideal for enjoying videos, DVDs and photos with Apple's breakthrough Front Row media experience. The MacBook is just one-inch thin and includes a built-in iSight video camera for video conferencing on-the-go with friends or family using iChat AV, recording a video podcast or iMovie using iLife '06, or taking fun snapshots with Photo Booth. Designed for the mobile lifestyle, the MacBook includes Apple's MagSafe Power Adapter that magnetically connects the power cord to the MacBook and safely disconnects under strain, preventing the notebook from falling off its work surface. Apple now also offers a new MagSafe Airline Adapter that makes using a MacBook on an airplane even more convenient by connecting to in-seat power ports for continued productivity throughout the duration of a flight. The MacBook also includes Apple's Sudden Motion Sensor, designed to protect the hard drive in case of a fall, and a simple and intuitive Scrolling TrackPad for scrolling through long web pages or panning across large photographs. The lightweight MacBook design includes built-in AirPort Extreme and Bluetooth 2.0+EDR (Enhanced Data Rate), making it ideal to take anywhere consumers work and play - from the office, to the classroom and the local WiFi hot spot. With the latest high-performance connectivity options, each MacBook includes built-in 10/100/1000 BASE-T Gigabit Ethernet, two USB 2.0 ports, a FireWire 400 port, combination analog and optical digital audio input and output ports and a mini-DVI video output to connect up to a 23-inch Apple Cinema HD Display. The MacBook comes with iLife '06, the next generation of Apple's award-winning suite of digital lifestyle applications featuring iPhoto, iMovie HD, iDVD, GarageBand and iWeb, the latest iLife application that makes it super-easy to create amazing websites with photos, blogs and podcasts and publish them on .mac for viewing by anyone on the Internet with just a single click. ** The MacBook also comes with the latest release of the world's most advanced operating system, Mac OS X version 10.4.8 Tiger, including Safari, Mail, iCal, iChat AV, Front Row and Photo Booth, running natively on the Intel-based notebook. The new MacBook is available immediately through the Apple Store, Apple's retail stores and Apple Authorized Resellers. The Apple MagSafe Airline Adapter is available for a suggested retail price of $59 (US). Additional build-to-order options for the MacBook include the ability to upgrade to 80 GB, 120 GB or 160 GB (5400 rpm) or a 200 GB (4200 rpm) hard drive, up to 2 GB DDR2 SDRAM, Apple USB Modem, Apple Mini-DVI to DVI adapter, Apple Mini-DVI to VGA adapter, Apple MagSafe Airline Adapter and the AppleCare Protection Plan. Additional build-to-order options also include: preinstalled copies of iWork '06, Logic Express 7, Final Cut Express HD 3.5 and Aperture 1.5. "Apple has upgraded its MacBook consumer notebook line, dropping the range's Core Duo processor for a more up-to-date Core 2 Duo chip. Once again three models are on offer: two white ones and a black version. "This time, the 2 GHz black model has a 120 GB hard drive as standard, so the extra $200 it costs doesn't entirely go on the paint job. The 2 GHz white MacBook has an 80 GB hard drive. Both machines will ship with 1 GB of 667 MHz memory." "The MacBook Pro Core 2 Duo's advantage over the Core Duo version ranged from 9% to 75% depending on what app we ran. The faster core clock speed should provide an 8% advantage, so everything beyond that is 'gravy.' Most surprising were the significant gains with Aperture 1.5 and Photoshop CS2." "Like the iMac before it, Apple's MacBook Pro underwent an upgrade highlighted by a chip swap - the Core Duo processor that used to power Apple's pro laptop is gone, replaced by the next-generation Core 2 Duo. And as with our iMac benchmarks, these updated Core 2 Duo MacBook Pro models show a modest performance gain when compared to older systems running on Core Duo chips with the same clock speeds. "Besides the switch to Core 2 Duo chips, the updated MacBook Pro models also received a bump in processor speed. The 15-inch models now feature processors running at 2.16 GHz and 2.33 GHz, compared to 2 GHz and 2.16 GHz in the old Core Duo systems. The 17-inch MacBook Pro now runs at 2.33 GHz, up from 2.16 GHz. Along with theboost to processor speed comes a jump in on-chip L2 cache - the latest MacBook Pros come with 4 MB of shared L2 cache, twice the amount of their predecessors. The new laptops also ship with more RAM and higher-capacity hard drives. "So what does this all mean in terms of performance?" "If you've used an Apple notebook for any extended length of time you probably have an opinion on its operating temperature. But how do you quantify the temperature of an Apple's [sic] notebook? Let's take a look at different ways to measure the temperature in the MacBook Pro. "You may have noticed that CoreDuoTemp (upper highlight in the screen shot at right), smcFanControl (lower highlight) and Fan Control all report different temperatures on the MacBook Pro. That's because they're measuring different things." "Since I purchased the 120 GB configuration and my previous MacBook Pro has a 160 GB drive (which is 80 percent full, mind you) it wasn't practical to use Apple's handy Migration Assistant to move my data over. Nor was it possible to clone one drive to the other with Mike Bombich's excellent Carbon Copy Cloner software. "Swapping hard drives in the MacBook Pro is not a trivial task nor for the weak of heart." 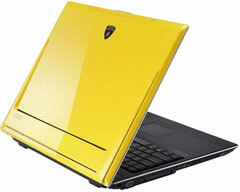 "Asus has confirmed it is preparing to ship an updated version of its Lamborghini VX1 laptop. Dubbed the 'Golden Edition', the machine boasts an almost top-of-the-range Core 2 Duo mobile processor, 2 GB of 667 MHz DDR 2 memory, a 160 GB hard drive and Nvidia's GeForce Go 7400 VX GPU. "As before, the Golden Edition VX1 will ship in yellow and black versions. Both models sport a 15in 1,400 x 1,050 display, Gigabit Ethernet, 802.11a/b/g wireless networking, Bluetooth 2.0 and all the usual ports and connectors." "Diamonds are a girl's best friend, roars Medion's latest announcement, but you won't find any such gemstones on its new notebook, a Chavette-friendly laptop embossed with 300 Swarovski crystals - lead glass, as the material's known in the trade - arranged in Medion's logo and a flower motif. "Yes, the ostentatious SIM 2060 laptop is aimed specifically at women - footballers' wives, we'd suggest. The machine's plastic casing is of a 'subtle' hue called 'pink chrome' with grey-green hints that looks as bad as it sounds. 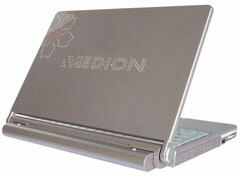 The Medion logo and flower decal are likewise coloured. The flower motif is repeated on the touchpad." The release of new Core 2 Duo powered MacBooks this week has precipitated another ratcheting down of prices on refurbished Macintel notebooks at the Apple Store. You can now get a Core Duo MacBook for $899, one with a SuperDrive for under $1,000, and a MacBook Pro for $1,399! If there was any doubt that the switch to Intel chips would result in lower prices, they should now be erased.